Edward Naughton is a veteran trial attorney with comprehensive experience in intellectual property and other complex business litigation. He has litigated dozens of patent, copyright, trademark, trade secret, licensing, false advertising, unfair competition, and other technology disputes in state and federal courts and before arbitration panels. Edward represents high-tech businesses in many different sectors, particularly in the software industry, advising clients on matters such as proprietary and open source software development and licensing, IT system development and integration, internet and e-commerce, trade secrets and non-competition agreements, and online and traditional media. Additionally, Edward has considerable appellate experience, having argued before the Supreme Judicial Court of Massachusetts and written briefs on a wide range of issues to the United States Supreme Court, the United States Courts of Appeals for the First, Second, and Federal Circuits, the Massachusetts Supreme Judicial Court, and the Massachusetts Appeals Court. 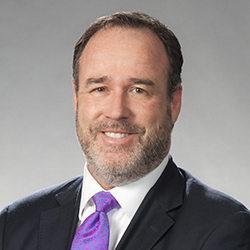 He has also successfully litigated many complex business disputes, including the defense of consumer, insurance, antitrust, and securities class actions and white collar criminal prosecutions. Represented leading developer of software tools asserting claims of patent infringement against competitor, rapidly securing a favorable settlement after presenting infringement analysis. Defended developer of electronic publishing software against claims of patent infringement involving color correction software and methods. Working with leading experts in the field of color science, developed substantial evidence to support defenses of noninfringement and invalidity, which led to a favorable resolution after a Markman hearing. Defended one of the world’s leading sports and lifestyle companies against claims brought by a patent holding company that alleged that our client’s e-commerce website infringed the patent; after filing a motion for summary judgment of invalidity, we secured a favorable settlement for a nominal payment. Currently defending this client against claims by another patent holding company that its footwear design infringes multiple patents. Represented a manufacturer of computer-controlled local anesthetic delivery systems in defense of patent claims, achieving a settlement for significantly less than the costs of defense following presentation of noninfringement analysis. Represented owner of patents covering innovative processes for generating environmentally-friendly synthesis gas in asserting claims of infringement and trade secret misappropriation against a competitor. We secured a favorable settlement, involving a substantial payment, after presentation of infringement analysis. With co-counsel, defended a major athletic shoe manufacturer in three cases alleging patent infringement, each seeking tens of millions of dollars in royalties on shock absorption and air cushioning technology. After Markman hearings, secured dismissal in one case, summary judgment in another, and obtained reexamination of the patent in the third. Represented a global manufacturer and distributor of cell phones and wireless handsets in defense of patent infringement claims by four separate patent licensing companies. Represented a developer of wireless mesh networking technology in successful defense of infringement claims brought by patent licensing company concerning power over Ethernet technology. We convinced the patent licensing company to abandon its claims of infringement. Defended manufacturer of arc-flash protective equipment against competitor’s claims of patent infringement; patent holder dismissed claims after deposition of inventor provided compelling evidence of invalidity. Defended IT services company against claims of infringement brought in East Texas by patent holding company; before answering, convinced plaintiff to dismiss claims following presentation of noninfringement analysis. Defended global cruise company against claims that it infringed numerous patents covering wireless technology; secured license and settlement at very favorable rates below the costs of defense. Lead trial counsel for enterprise software company in claims against former executive for violations of nondisclosure and noncompetition obligations. After winning summary judgment on the former executive’s counterclaims, which sought to rescind the $20 million acquisition of his company, obtained a favorable and substantial settlement. Lead trial counsel for consulting firm accused of taking trade secrets in workflow software and violating non-competition agreement. After four-week jury trial resulted in adverse jury verdict, obtained JNOV overturning verdict. Lead trial counsel for enterprise software company in claims against offshore software development company that had failed to properly re-engineer software, securing a seven-figure settlement. Co-counsel defending Microsoft against a putative consumer class action alleging that it had violated wiretapping statutes and common law privacy rights by designing Windows to permit third parties to place cookies on computers. Obtained dismissal of complaint. Represented investors in a venture capital-backed biotech company in litigation brought by the company against a Harvard-affiliated research hospital and its principal investigator alleging that experimental data had been fraudulently altered. After discovery, secured a substantial settlement for the company and its investors. Represented developer of collaboration software in end user license compliance disputes against large corporate end users, generating more than $1.5 million in incremental revenue. Represented Microsoft in several dozen lawsuits against resellers and corporate end-users of counterfeit, infringing, and unlicensed software. Successfully pursued Lanham Act and false advertising claims on behalf of leading software developer whose competitor made false and misleading claims about capabilities and performance of developer’s software. Appellate counsel representing Boston College against The Big East Conference and its members in litigation arising from BC’s withdrawal from the conference to join the Atlantic Coast Conference. On summary judgment, secured declaratory judgment of no liability. After expedited briefing in the appeals court, case settled favorably for BC. Co-counsel for international manufacturer of polyester staple fiber in defense of multiple putative class action claims brought by consumers and indirect purchasers who alleged price fixing and sought damages in excess of $150 million. Obtained dismissal of claims in three separate actions. Advised developer of collaboration software in connection with its shift from proprietary software model to open source software model, including intellectual property, revenue model, licensing, and related issues. Advise software developers concerning incorporation of open source software in code base and the development of corporate policies regarding the use of open source code. Conduct due diligence into and resolve issues arising from open source code in context of merger and acquisition transactions. Advised leading international software developers on shrink-wrap license issues, copyright protection in mischanneled software, first sale doctrine, and compliance with distribution and eligibility restrictions. Represented application and enterprise software developers in negotiating complex licensing transactions for outsourcing software reengineering needs, including software development and ownership, software and hardware selection, implementation, and licensing. Drafted and negotiated dozens of licensing, services, and support agreements for enterprise and application software developers and corporate end users. Designed and executed license compliance and anti-piracy programs for leading software developers. Advised Fortune 50 consumer products company in connection with development of internal anti-piracy capability for razor and blade products.